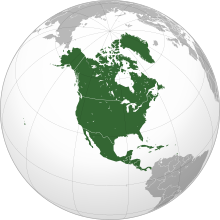 North America covers an area of about 24,709,000 square kilometers (9,540,000 square miles), about 16.5% of the earth’s land area and about 4.8% of its total surface. North America is the third largest continent by area, following Asia and Africa, and the fourth by population after Asia, Africa, and Europe. In 2013, its population was estimated at nearly 579 million people in 23 independent states, or about 7.5% of the world’s population, if nearby islands (most notably the Caribbean) are included. Territories, dependencies, and subnational entities of a country not located primarily in North America are italicized. Eagle Scout is the highest rank attainable in the Boy Scouting program of the Boy Scouts of America (BSA). Those who attain this rank are called an Eagle Scout or Eagle. Since its introduction in 1911, the Eagle Scout rank has been earned by more than 1.7 million young men. The title of Eagle Scout is held for life, thus giving rise to the phrase “Once an Eagle, always an Eagle”. Requirements include earning at least 21 merit badges and demonstrating Scout Spirit, service, and leadership. This includes an extensive service project that the Scout plans, organizes, leads, and manages. Eagle Scouts are presented with a medal and a badge that visibly recognizes the accomplishments of the Scout. Additional recognition can be earned through Eagle Palms, awarded for completing additional tenure, leadership, and merit badge requirements. The planes that serve as Air Force One can be operated as a military command center in the event of an incident such as a nuclear attack. Operational modifications include aerial refueling capability, electronic countermeasures (ECMs) which jam enemy radar, and flares to avoid heat-seeking missiles. The heavily shielded electronics onboard include around twice the amount of wiring found in a regular 747. …that the CIA began to recruit and train anti-Castro forces for the Bay of Pigs Invasion in the Sierra Madre mountains on the Pacific coast of Guatemala? …that the Pewee Valley Confederate Memorial (pictured) is the only American Civil War obelisk monument in Kentucky to be made of zinc? …that the Soufrière Hills volcano is an active complex stratovolcano with many lava domes forming its summit on the Caribbean island of Montserrat? … that the First Mexican Empire was the official name of independent Mexico under a monarchical regime from 1822 to 1823? …that the Land Run of 1889 resulted in the founding of both Oklahoma City and Guthrie, whose populations grew from zero to over 10,000 in less than a day? Charles Edward Magoon (December 5, 1861 – January 14, 1920) was an American lawyer, judge, diplomat, and administrator who is best remembered as a governor of the Panama Canal Zone and an occupation governor of Cuba. He was also the subject of several small scandals during his career. Magoon was born in Owatonna, Steele County, Minnesota. As a legal advisor working for the United States Department of War, he drafted recommendations and reports that were used by Congress and the executive branch in governing the United States’ new territories following the Spanish–American War. These reports were collected as a published book in 1902, then considered the seminal work on the subject. During his time as a governor, Magoon worked to put these recommendations into practice.